If you have diabetes and are traveling, there may come a time where you need to purchase medical supplies from a pharmacy. Our Diabetes Type 1 Pharmacy cards will help you communicate to a pharmacist, a doctor or to the pharmacy staff what you need. 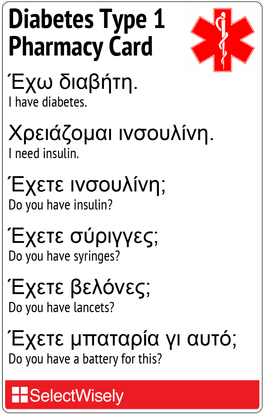 Our Diabetes Type 1 Pharmacy cards are available in various languages such as Spanish, Italian, French, Thai, Chinese and more. Do you have a battery for this? This is my doctor prescription. This is my doctor's name and address. 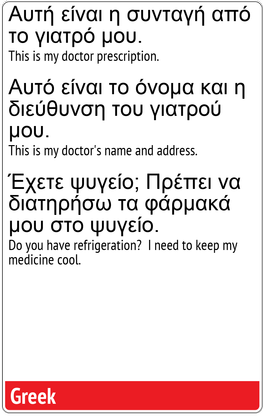 Do you have refrigeration? I need to keep my medicine cool.